For the first time in seven years, sales prices for small commercial properties outperformed their counterparts in the large-cap domain. 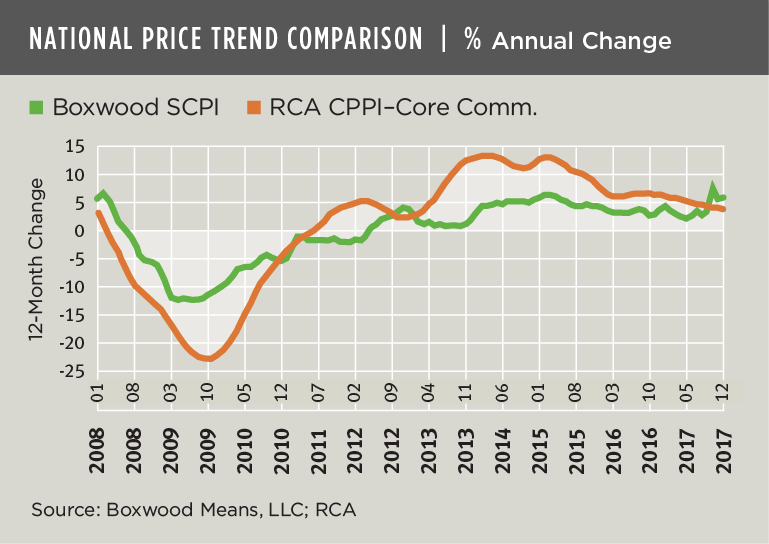 Boxwood's Small Commercial Price Index (SCPI) that tracks sales prices of properties trading under $5 million in value finished 2017 with an annual return of 5.9%, the highest price gain since the previous peak in 2007. SCPI's annual return comfortably beat the 3.7% growth of the commercial component of RCA’s CPPI (that includes CRE trades above $2.5 million and excludes multifamily) which was the smallest increase for institutional CRE assets in five years. See the trends in the nearby graph. These price trends are redolent of the old tortoise and the hare story where the slow and steady stride of the small caps ultimately wins out against the faster (and more volatile) pace of large caps. RCA reported that the volume declines were caused by growing selectivity of institutionally-oriented buyers especially in major markets. Transaction volume totaled $463.9 billion last year, down 7% and 15% over two years. Portfolio sales dropped 22% but single-asset sales contracted by only 5%. What that suggests is that investors seeking larger deals are balking at record-level prices for trophy properties while buyers for smaller assets have proved to be less price sensitive. As a result, the large-cap volume pullback, coupled with a shift in sales to secondary and tertiary markets, has kept the lid on price growth1. The small-cap arena tells a more dynamic story. Transaction volume of $119.4 billion in 2017 likely set a new high-water mark, up 19.3% over the previous year which itself was the second-best total since at least 2008. Sales activity surged during Q4, which is a typical year-end event but was conspicuous only by the absence of a complementary uptick in transaction volume in the large-cap domain. Last year’s robust sales volume reflected the market’s continued liquidity and attractive yields of smaller assets for small-time investors as well as owner-users of small businesses. The increased volume, in turn, has pushed small-cap CRE prices to nearly all-time highs2. While investment market conditions remain favorable, small-balance lenders and investors will need to be more diligent in light of the full recovery in small-cap CRE prices. 1 While the CPPI-Commercial component grew modestly, RCA's apartment CPPI rose 10.6% over the year. 2 SCPI has recovered within 0.1% of its pre-recession peak. By contrast, small-cap multifamily prices have outperformed by a wide margin rising 9.2% last year – the highest annual growth rate in three years. As of December data, Boxwood's Small Multifamily Price Index was 39.8% above the previous peak in 2006.